Companies may utilize crowdfunding for a number of reasons – to expand their inventory, grow staff, open a new store, or even get them out of debt. 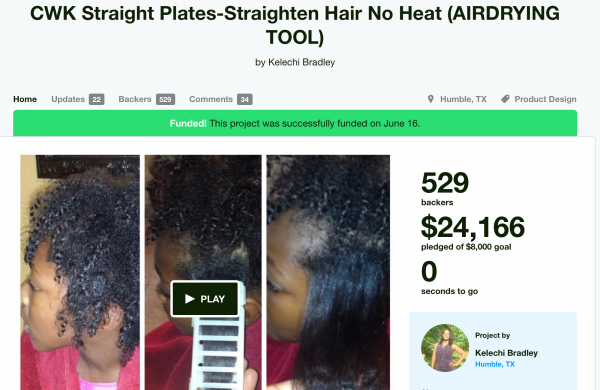 Earlier this year, there was a lot of buzz about the production of “CWK Straight Plates,” which promised nearly silky, straight hair without the use of heat, answering the prayers of many naturals. The project was successfully funded and backers are expected to receive their plates this fall in the first production run. The owners of PuffCuff, an innovative hair tool that is NOT a banana clip, started an Indiegogo campaign to expand their inventory to various sizes of the PuffCuff, rather than produce it for the first time. They requested $3,700 from supporters in exchange for bundles with the new different sizes of the tool once funded. 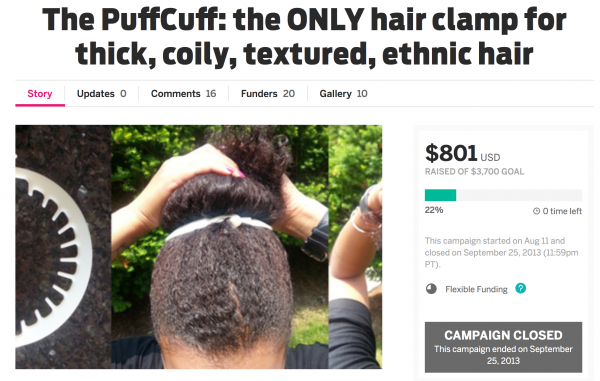 Unfortunately, the campaign did not meet its goal, but the original PuffCuff is still available for purchase. 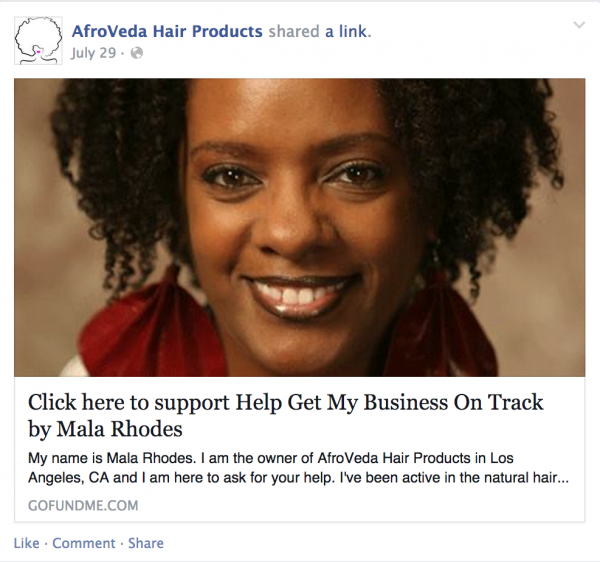 In a bold move, ayurveda-based line AfroVeda started a gofundme campaign in order to get their “business back on track.” At the time, there were several complaints on the AfroVeda Facebook page about customers not receiving orders, so it seemed that they needed the funds to buy ingredients for their products and fulfill back orders. The owner stated that she would need to come up with “$7,520 in loans and over due debts that must be paid by the end of the first full week in August in order to keep the business open.” This campaign seems to have been deleted from the gofundme site, and you can still place orders on the AfroVeda site, though several items are on 3-4 week backorder. Okay, so the “bad times” point is a big deal to me. I’m all for supporting businesses and helping them grow, especially black-owned businesses, but please, don’t expect customers to pull you out of your debt. We’re consumers, we are not a bank. I also take issue with companies who have not shown their business savvy in the past and depend on consumers to bail them out of their situation. There is a difference between expanding your business and keeping your business afloat. Obviously, people will contribute if they believe in the company or the person, but make sure you know where your money is going. And that’s all there is to it. Do you contribute to crowdsourcing campaigns? Do you think crowdfunding is an efficient business strategy? This article also appears on Black Girl with Long Hair. History Repeating: Texture Manageability Systems On the Rise, Will Relaxers Make a Comeback? Elle’s Beauty Finds Inside and Out! For really good reasons yes! My friend won her home in a lottery and needed help with additional items a loan couldn’t cover. I have her money. But for a business, I would not, because as a business it’s expected you will fail. That’s how you get back up and succeed. Because people think it’s an option, they will use it. If it wasn’t, they would not have a choice. But I guess it’s the same as investors for other types of businesses. I do not contribute because I don’t get it. I get so many emails every day from random companies asking me to donate and then when they fall through or don’t produce what they say – I am just out? Where’s the accountability? I definitely understand the issue of accountability. Of course, there are companies that have failed to hold up their end of the bargain, but overall most of them do follow through on their projects and the rewards/perks. One way for a company to combat this fear is to update their campaign a lot. Communication is key. Reblogged this on Benoté Blog. We’ve run into this problem with our natural hair novel: interest that doesn’t convert into sales.